Hi all, today I’m going to talk about the ridiculousness of wedding planning (yes, call me Capt Obvious haha. I can’t possibly be talking about how to bake a cake with a suggestive title like that). It’s 1 am and I should be sound asleep or at least be in bed playing Plants vs Zombies as per my usual nightly routine, but I’ve been on my laptop since god knows when doing research upon research on makeup artists, photographers and wedding venues. So, when 2016 came around 3 weeks ago (which I never got to wish everyone! So belated Happy New Year all! ), instead of writing a reflective post on how 2015 has been for me, I was busy panicking about my wedding. You see, we haven’t done much the last 8 months since we got engaged because well..planning a wedding can’t be that hard right….. I mean, you’re essentially just planning for a weekend only, why need a whole year to do it? I saw the checklist, we made an excel etc, but we just never got why the rush and stress. I also never got how people had to take loan, or blew more than RM100k for their wedding. Man….now I know why. So I started with doing plenty of googling, Pinterest-pinning, Facebook-stalking all all that modern planning jazz. Ok, doesn’t look that hard. All I need to do is find a random place, decorate it with flowers, get ready, done! But then I started realizing that the options are limitless! Do we wanna do it in a restaurant (chinese? western? ), a hotel, a hall, a bungalow, a cafe…?? Do we want a rustic wedding, a traditional one, a quirky one, a romantic one..?? How many ceremonies/events do we want to have? What kind of decor? What color? What kind of dress? Who to invite? There are so many insane things going on at the same time, and so many different opinions! I’m sure you married ones can attest to this stress, and you unmarried ones are wishing that it’ll never come down to this for you. Worst of all? We are two SUPER thrifty people. You guys know how stingy I can be..I never buy anything more than RM50 and if I have to, I take a long time deciding and it drives me crazy. Karthik on the other hand, is just a minimalist. He doesn’t spend if he doesn’t have to. And in his opinion, this whole shebang is unnecessary. We had an honest conversation about how much we are willing to throw in for our wedding. We reluctantly came up with RM20,000 total, cash we’re willing to part for this wedding. I started emailing for quotations and when the rates came back, my heart sank. Venues cost RM150-200 at least per person, my budget is RM100 including alcohol. Makeup artists cost RM1000+. My budget is RM500. Dresses cost RM1500-2000. My budget is RM500. Plus I have to get a saree too whoopdeedoo. Photography…oh gosh, photography costs RM3000 PER session. I have 3 sessions (granted, I don’t need them all to be photographed..) and my budget is RM3000 for all 3. Including videography if possible. Man how naive we were. Cherry on the cake? The Indian makeup artists are all booked already. 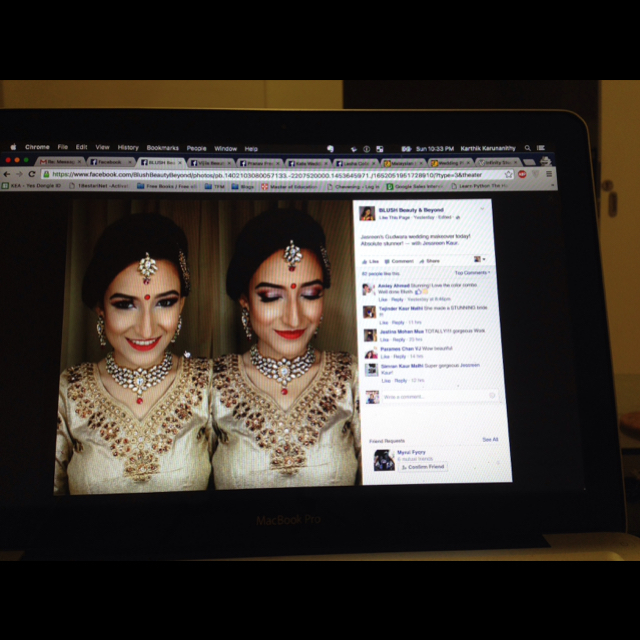 I thought I could get them so I could do makeup, hair and saree draping altogether, but they’re all booked!!! One of them even told me that I should’ve booked a year in advance. Why does this cost RM1500?? I mean it’s absolutely stunning and I’d love to look like that on my wedding day, but..RM1500? Some of my students’ parents earn half that amount a month to feed 5 in the family! Since when did weddings become so expensive? Most importantly, how do people afford this? The vendors I’ve asked are probably not the most expensive in the market, so how much can it actually go up to? This is unfathomable insanity. And what’s even worst is obviously there’s a part of me that’s just desperately hoping that I can have a fairytale wedding too. One that people would go “wow this wedding is the best I’ve been to ever!”. One that would get my heart racing everytime I think about it, years down the road. One that we would show videos and pictures to our kids and grandkids and they’d hold their breath, marvelled at such beauty and showcase of love. My wedding is one of many my friends would attend this year. Our memory of our marriage will not be based on the wedding, but on the love and life we’ve built together. Our kids and grandkids would probably skim through the pictures halfheartedly, distracted by fancier gadgets and cooler stories. I just need to tell myself to let go and let live a little. Yes, it’s once in a lifetime, but so are many things like my first step and my first period. I didn’t have pictorial proof of either but they did happen and were both equally as momentous in my memory. So I guess here starts my #budgetwedding planning! I’ll document it as much as possible so I can hold myself accountable to this post and this possibly shortlived realization on a late somber night.